Ready for a new game? Here comes 9 Monkeys of Shaolin, from the team that brought us Redeemer Enhanced Edition. Published by BUKA Entertainment and developed by Sobaka Studio, this game is a 90s inspired beat-em-up designed with two player co-op in mind. (Although, you can play solo if you want.) 9 Monkeys of Shaolin is set to release early winter 2019. In 9 Monkeys of Shaolin, you play as Chinese fisherman named Wei Cheng. He is out to avenge the deaths of the family and friends he lost when the pirates raided his village. Wield your battle staff and use it to send enemy attacks back at them. BAM! 3 unique fighting styles: fight on earth, in the air or use mysterious magic seals. Combine these elements to defeat every enemy on your way. POW! Captivating narrative: discover the fascinating story of Wei Cheng and follow him as he rises from a simple fisherman to the master of Shaolin martial arts. CRACK! Stunning visual style: unlikely combination of historical and mystical elements gives you an exciting experience from every scene appears on screen. BOOM! Extensive character development system: you learn a great deal of ways to victory as you discover various unlockable perks, items and fighting styles. CRASH! More than 25 different levels: Chinese villages, pirate ship, Buddhist monasteries, Japanese mansions, ancient ruins and much more. WROOOM! 10 types of Chinese and Japanese polearms, each with its unique traits. Discover the landscapes to find new items! 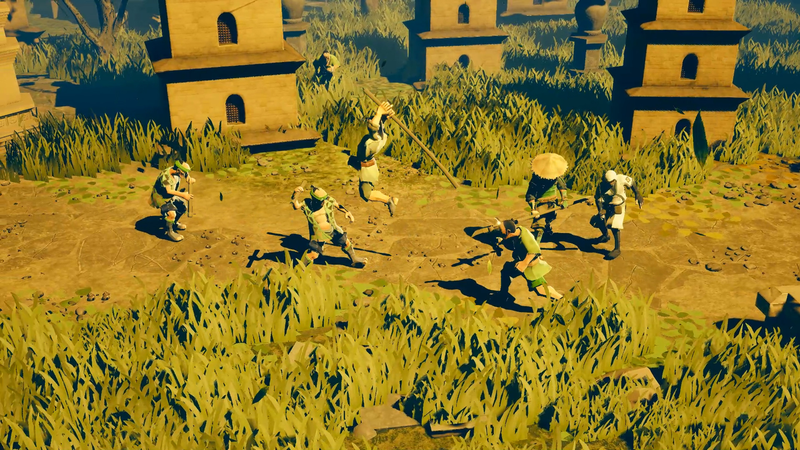 9 Monkeys of Shaolin is expected to release in winter 2019 for the PlayStation 4, Xbox One, Nintendo Switch, and PC. While you wait, you can get your beat-em-up fix from Sobaka Studio’s other upcoming beat-em-up, Redeemer: Enhanced Edition, which is now set to arrive fall 2018.